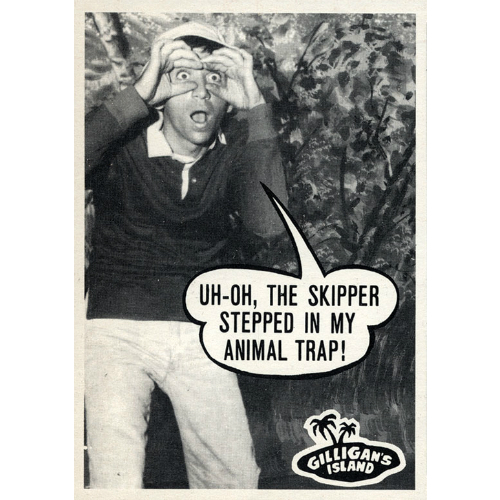 The 1965 Topps Gilligan's Island trading card series features images from the first season of the iconic 60s sitcom. 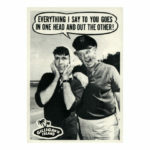 Each card front has a black and white image of America's favorite castaways with speech bubbles giving each card a comic feel. The reverse of each card includes to half-card images. When the deck of cards is stacked, the reverse images form a flip book of an "animated" scene. Due to the flip book feature of the card backs, undamaged cards in this set can come at quite a price. The show's enduring legacy also aides in inflated prices for even mid-grade cards. Our checklist includes all of the cards in this series and can be searched or sorted. 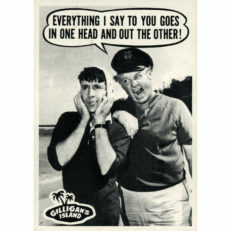 1 You'll be safe Skipper! 3 Somebody call for a handy man? 4 Are you sure this will go up? 5 Don't hit them too hard! They're only eggs! 9 It's a bird! It's a plane! 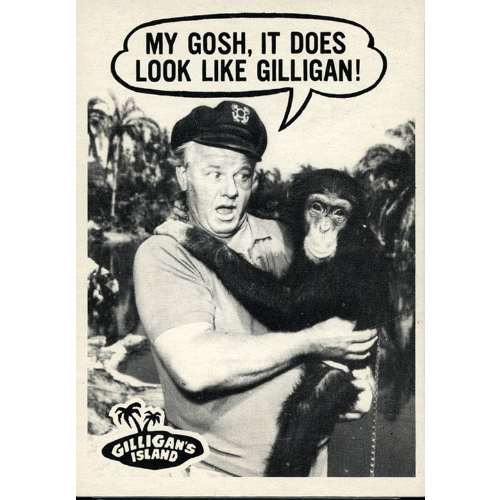 No, it's Gilligan! 11 If you say one word I'll kill myself! 12 What could go wrong with me at the wheel? 13 it's the footprint of a horrible monster! 14 Always happy to lend a hand, Skipper! 16 My gosh, it does look like Gilligan! 17 There's soemthing fishy about this place! 19 You're so strong, so brave, so fearless! 23 Why did I sit on that ant hill? 24 Are you sure Tarzan started this way? 26 I think the radio is fixed! Yeah? 27 A sentry must always be alert! 28 Ever have a fish in your mouth? 30 Where are we going on this raft? 31 Gee, we could be stuck here for years! 32 One false move and I'll shoot! 36 I'm a witch doctor making a house call! 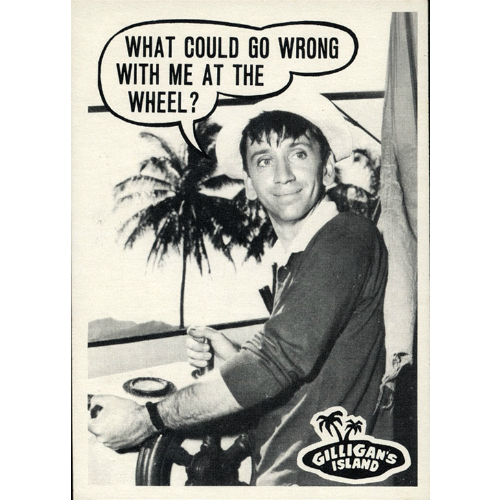 37 Gilligan to the Rescue! 38 Can you see anything? 39 What a crazy time to gargle! 40 Only an idiot would fly this plane! 41 Why'd I have to be stuck on the same island with you? 42 Anyone for a showdown! 43 Aw come on, stick 'em up!! 44 Uh-oh, the Skipper stepped in my animal trap! 45 They'll never find me in this poison ivy! 46 I'm starting my own fan club! 47 I think I'm losing my mind! Don't worry! 50 Let me at him! Let me at him! 51 I'm the brains of this outfit! 52 I'm plane crazy about flying! 54 I think I'm seasick.